Oh, my…..it is so much more beautiful that we remembered…. It had been nearly two years since we had found ourselves in Leelanau County, Michigan. On Thursday, we packed up the rig in Byron Center and prepared to head north. 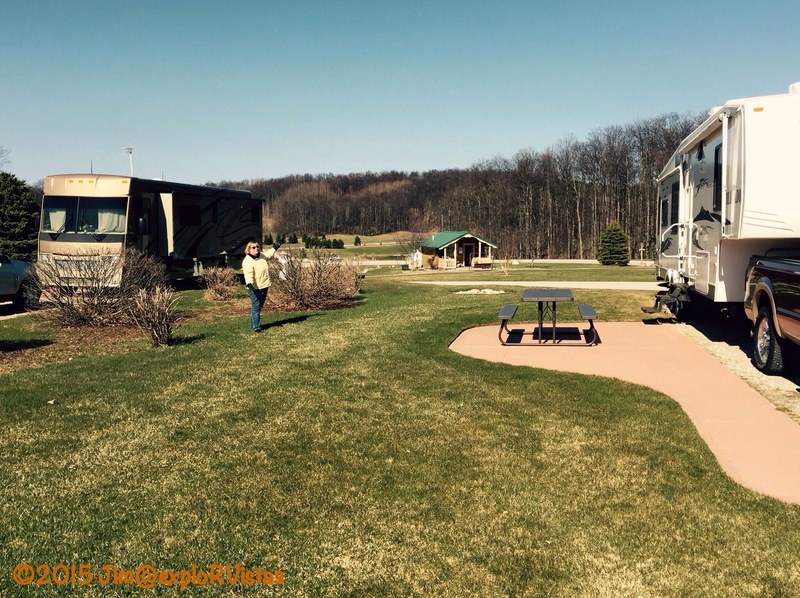 A very big thank you to Richard at Woodchip Campground in Byron Center, Michigan for providing such a wonderful resource to the community by keeping the park open through the winter. We had instances where the temperature dipped to 16 below zero, and we were never without power, water or sewer. 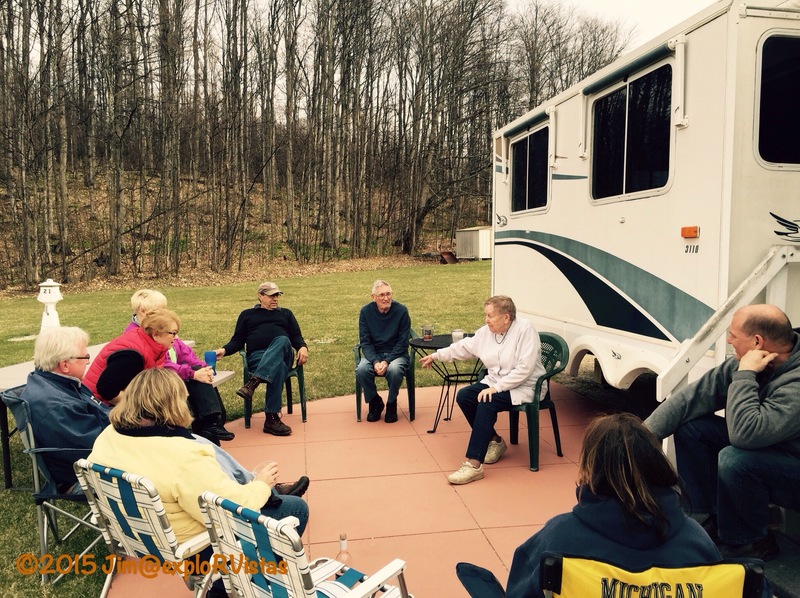 We encourage anyone needing a campground in the Grand Rapids area to contact Woodchip. We made the three hour trip to Lake Leelanau in the afternoon, arriving at Wild Cherry Resort around 4 PM. And Diana is extremely pleased with her new commute! Once we were set up, we had a very nice chat with our work camping colleagues, JoAnn and Paul. We are really looking forward to working with them! Following our chat, Diana and I headed a few miles west to the town of Leland to catch the sunset. We arrived in plenty of time to watch the sun set over North Manitou Island, several miles out in Lake Michigan. South Manitou is to the left. Once the sun actually set, we were treated to a spectacular light show in the clouds! On Friday, Diana worked with JoAnn, beginning the learning process of how to run the office. I worked with Paul out in the park, setting up the lion’s share of the picnic tables. Paul also gave me a tour of the resort, which is far larger than I thought. 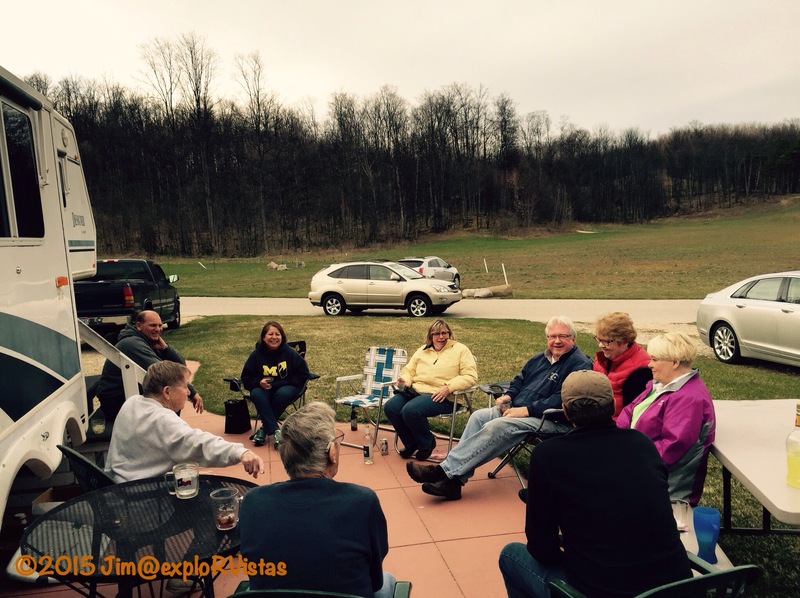 After we finished up for the day, we were all invited to happy hour by Rex and Nellie. 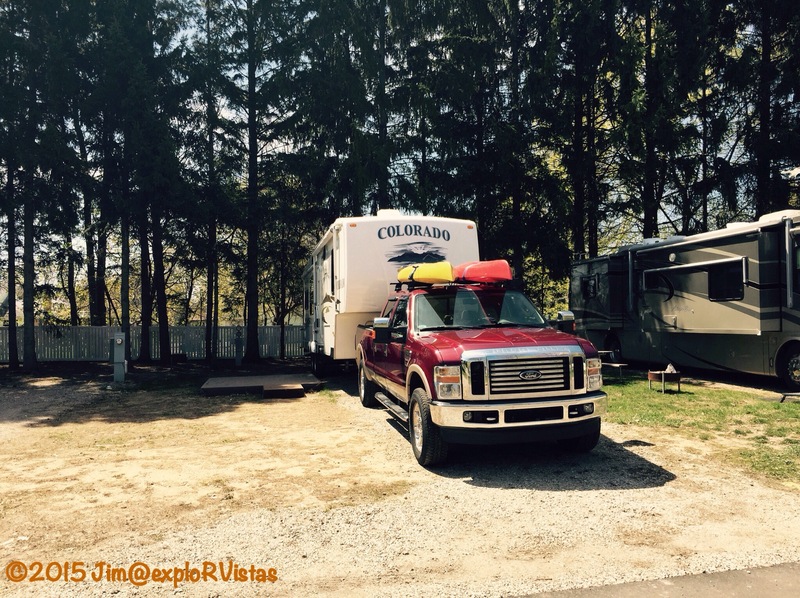 They were full time RVers for 18 years, before coming off the road. They have been summering here every season since the park opened, better than 10 years ago. Rex mows the lawns in the park. He is a D-Day veteran, and it is an honor to be in his presence. Also present were Rex and Nellie’s son Bruce, Jim and Sandy, owners of the park, and Camilla, who will be helping some in the office. She just started a new job as the executive assistant for the Leelanau Peninnsula Vintners Association. Everyone had a great time. It was a very nice way to start the summer. We look forward to posting more of our Northern Michigan adventures, as we plan on doing a lot of exploring throughout the summer. Stay tuned as we show this little slice of paradise! I’ve always wanted to go to Northern Michigan, crossing the Mackinaw Bridge is a bucket list item for me. Not sure when we will get there but I will be following your summer adventures with interest! We think you would like it up here, Kelly! We will do our best to point out all that this area has to offer. Thanks for commenting! We loved you OBX posts! It looks like you guys have a nice summer ahead of you. I’m looking forward to hearing about your workamping duties. Thanks! Come on up and we can have an Allen Park reunion! Come on over and visit, Peter! So happy for the both of you on your up-coming summer camping job and adventure. The campsite you have looks great. Loved the sunset photos too. Can not wait to read more of your up-coming posts. Take care and love life. Thanks, Fred! Can’t wait to meet up with you guys again! Great photos. As someone who is planning on full timing it in a couple years, I’m trying to learn what I can. How did you keep the water hose from freezing in such cold weather? We bought a heated hose at Camping World that is rated to 40 below zero. It worked great! We originally weren’t planning on crossing the Mackinac Bridge during our UP visit the first week in September, but you’ve piqued my interest and we just might consider changing direction. It is funny to see the group all bundled up in clothing and no leaves on the trees. Nighttime temps aren’t dropping much below 70 degrees and day time temps are hitting 100 here in Phoenix. I don’t even know where I put my sweatshirt LOL. It was actually fairly comfortable, Ingrid. 🙂 We would love it you and Al were able to stop over and visit! Hey Guys! We did it! 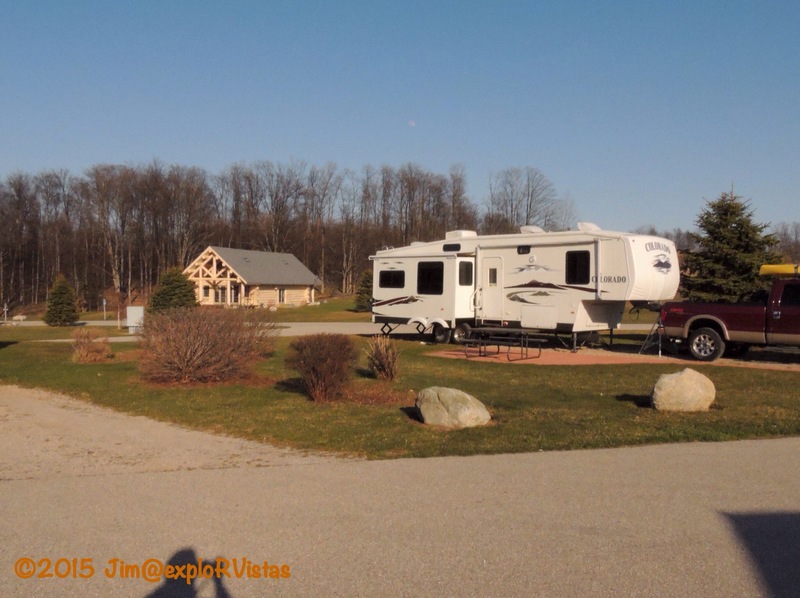 Sold the house – closed yesterday and we’re picking up our new fifth wheel on Thursday. Heading to Auburn in the Gold Country next Sunday for a two day RV Driving School class then off to our camp hosting position at Toll Bridge Campground in the tiny town of Mt. Hood! Looking forward to your new posts at your new place. You both have been our inspiration on this journey. Hope to have our blog up before long. So many things to do still. Yikes! Wow, wow and WOW!!!!! Congratulations!!!! This is super news, guys! Can’t wait to see the blog, and also to meet up with you again! I bet it is nice to finally be in your summer home! We have never been to Michigan despite living in Minnesota and Wisconsin for all my life. I definitely want to get there some day. What route are you taking to (or from) Ontario? It is beautiful now and stunning in October. Stop by, if you get a chance! As of right now it looks like we are going up through Duluth into Grand Portage. I will have to see how the fall schedule looks, that would be fun! You would love it here, Mark! What a sunset, so red! Very beautiful. 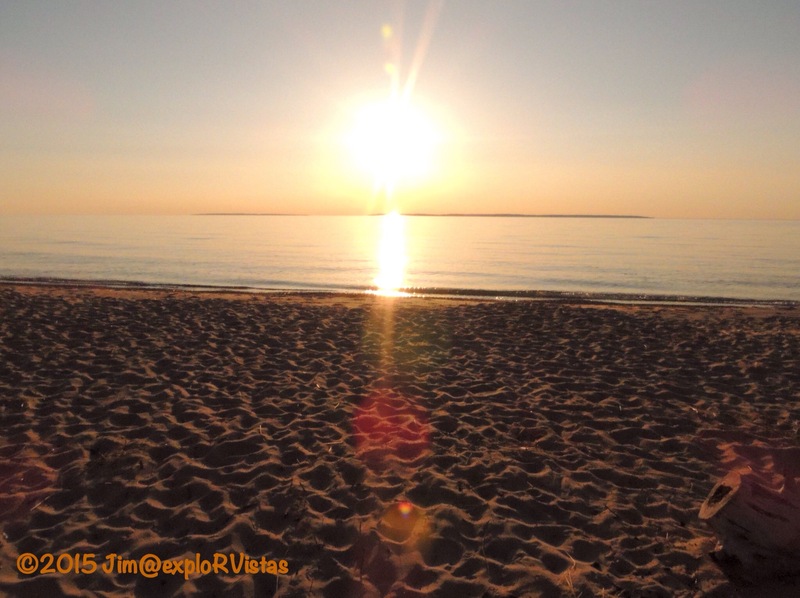 Look forward to hearing more from Northern Michigan and see more stunning sunsets throughout the summer. Looks like you got a great spot there! It is so peaceful, Inger! It is going to be a good summer, for sure. Looks like a nice time. What a beautiful red sky! The first few days have been amazing, Gin!